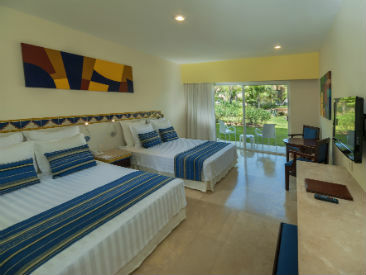 Viva Wyndham Azteca is an all-inclusive resort and Vacation Express Favorite situated on a beautiful, white-sand beach within the exclusive Playacar complex in Playa del Carmen. In addition to buffet dining, the resort offers specially themed a la carte dinner restaurants and a casual 24-hour snack bar at the pool. 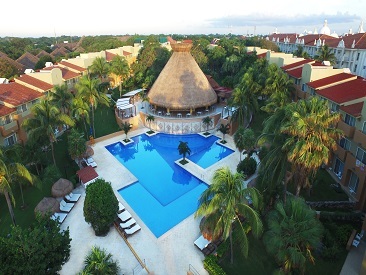 Guests will find the main pool and spa ideal for relaxing in the glorious Mayan sun. For families with children, guests have access to two kids clubs, designed for fun activities for ages 4–12. The family-friendly resort promises an unforgettable, relaxing atmosphere in a tropical paradise. 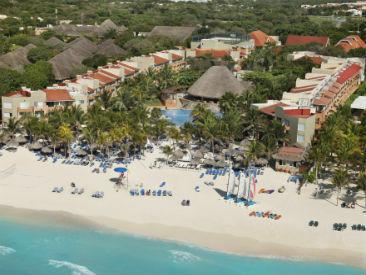 The all-inclusive Viva Wyndham Azteca is situated on a beautiful white-sand beach within the exclusive Playacar complex. Guests have full privileges at nearby companion resort, Viva Wyndham Maya, just a short beach walk away. In addition to buffet dining, the resort offers specially themed a la carte dinner restaurants and a casual 24-hour snack bar at the pool. Guests will find the main pool and spa tub the ideal spot to relax and soak up the glorious Mayan sun. Renova Spa, located at the Viva Wyndham Maya, offers a host of pampering treatments and services, including a number of signature spa packages just perfect for enhancing your vacation experience. Families with children have access to two kids clubs designed for fun for ages 4 – 12. The family-friendly resort promises an unforgettable relaxing atmosphere for all ages. Located just two miles from trendy Playa del Carmen, a 10-minute walk from Playacar Golf Club and 35 miles from Cancun International Airport. Valid for US residents only. Available for guests 60 years and older. ID required upon check-in. Program must be requested at the moment that reservation is booked. Participating affiliated stores are identified with the Viva Wyndham Logo. Restrictions: A preset menu is offered for groups of more than 11 people. Legal ceremony available for an additional charge. To celebrate this traditional Mayan Ceremony, it is necessary to have a Chaman or Mayan Minister present in order to unify the couple. The Chaman is chosen in a “Choice of God” meeting with representatives who have knowledge and experience in religious acts. The ritual consists of various steps: Mutual Acceptance, Purification, Offering and Union and benediction of the couple. The ceremony is transcendental, where the family and friends participate and share with the couple their unforgettable experience. The advice of the Chaman reflects the incredible energy and creates a magical confirmation of their union in front of the universe. It is unified with the fertility dance. Requirements: Birth certificate; single status affidavit; divorce certificate (if necessary). Inclusions are subject to change. Copy of the marriage certificate required upon check-in, and within six months of marriage. Please Note: Effective September 1, the Mexican government implemented a new environmental city fee to all guests staying at hotels in select Riviera Maya/Playa Del Carmen regions. The fee is $20 pesos beginning January 1, 2018 (about $1.10 USD per room per night). This new fee will be collected upon check-in from all guests. This property participates in Green Globe Certification. Certification measures the property's impact on one or more of the following: environment, community, cultural-heritage, the local economy. Please Note: All rooms at all Viva Wyndham resorts are non-smoking. Smoking is permitted on the balconies.